All orders will incur a AU$5 fee to go towards the cost of postage. Please scroll down the page for Activities and Resources. An insightful and provocative collection of true-life stories written by people who know the disease best, those who live with it daily either as caring family and friends or those living with the symptoms. Yet with humour and love woven into each story this could not be considered a sad book, more a collection of personal events and realisations. IDEAL FOR: people who want to see the true strength of love, the power of humour and to understand more about this disease without wading through text books. 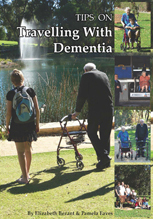 Written with the complete endorsement of Alzheimer's Australia, this books contains inspiring and humorous true-life stories and poems just like Stolen Moments, but it also contains so much more. Written from one carer to another, Caring Moments takes the reader through the complete dementia journey. Between its 228 pages you will find clear, understandable explanations of every stage and trait of the disease, along with advice and hints to get you through the good and bad days. IDEAL FOR: those who are caring full-time, part-time or even casually for somebody diagnosed with dementia or Alzheimer's. Written in a clear and practical style, from one carer to another, this book is written to be as understandable by teenagers as it is by adults. Buy it for yourself or for a friend, then leave it on the coffee table to answer questions as they arise. The onset of Alzheimer’s or dementia can add an urgency to long-dreamed of trips while at the same time bring extra concerns and decisions. Forward planning and being ready for anything is the best way to ensure a relaxed and fun holiday. This book will help you with that. IDEAL FOR: those planning day trips or trips of a life-time, but also for those who are expecting visits from those diagnosed with dementia or Alzheimer's disease. Do you want to write about your life, but don't like the thought of writing a whole book? Do you want to know the tricks to writing a powerful short-story about an event in your life? If so, this is the book for you. It covers 10 different ways (yes, 10) you can record your life, explaining the differences between each, techniques on writing each, and so much more. It evens helps you decide which style suits you best. Based on one of my most popular workshop and courses, this book will answer questions and encourage you to start writing today. IDEAL FOR: Written in an easy to understand and down-to-earth style, this workbook is suitable for all ages and all levels. As the title suggests, this book is designed to answer the questions complete beginners and novices have with regards to writing. Written in a relaxed and friendly style, it covers much of the relevant and practical information I have learned in my years as a writer. TOPICS INCLUDE:Learning ways to improve your language skills,Discovering techniques in everyday life that will add depth to your writing,Knowing how to set up your computer so you lessen the chance of RSI,How to stop life getting in the way of your writing,Techniques to overcome Writer's Block. IDEAL FOR: With over 188 A5 pages of information, advice and humour this workbook is bound to get even the earliest beginner closer to their dream of becoming a writer. Designed to make any biographical writing easier, this pack of over 100 different cards provides an endless supply of writing exercises to trigger forgotten memories. Each question is perennial, allowing it to be used many times over and still result in new recollections. IDEAL FOR: Buy them for yourself, for a friend or for your writing/discussion group, because this little bag of tricks will always give you something to write about. Ideal to spark creative thoughts and memories, these 50 original Stephen Bezant photographs were designed specifically as triggers for writing exercises, discussion groups and journal entries. Covering a wide range of topics these visual prompts will never leave you wondering what you can talk or write about. IDEAL FOR: Perfect for all ages and writing/conversational levels. This is a neat little pack containing a pocket-sized notebook and an easy-to-understand booklet on how to write haiku poetry. Designed for easy and frequent use, this pack makes a great gift or activity to have on hand. No poetic experience required. Why Haiku poetry? Read our article. IDEAL FOR: Perfect for all ages, a fantastic activity to do with grandchildren and while waiting. Painting at any age is a fun, creative and inspiring pastime, and this kit comes with everything you will need, except the water. Suitable for five year olds or ninety-five year olds, acrylic painting offers the feel and texture of oil painting without the smell or mess. This kit also comes with a booklet of ideas and instructions. Why painting? Read our article. IDEAL FOR: Perfect for all ages and skills, and a wonderful activity to do with grandchildren. This mini-scrapbooking kit is a complete gift or activity in itself. 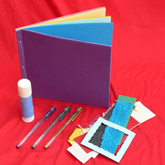 Coming with the delightful hand-made paper books, you have everything you need for a fun and creative project – including a booklet of suggestions and instructions. IDEAL FOR: Perfect for all ages, and a wonderful activity to do with grandchildren. 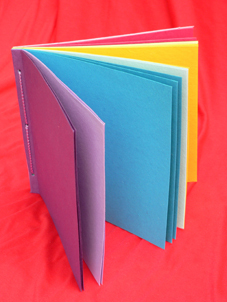 These vibrantly-coloured, hand-made paper books are fun to use and have so many more uses than we can list here. Regardless of whether you’re scrapbooking an event, looking for the perfect holder of prompt photos or storing pressed flowers with grandchildren, these 20 page books are ideal.